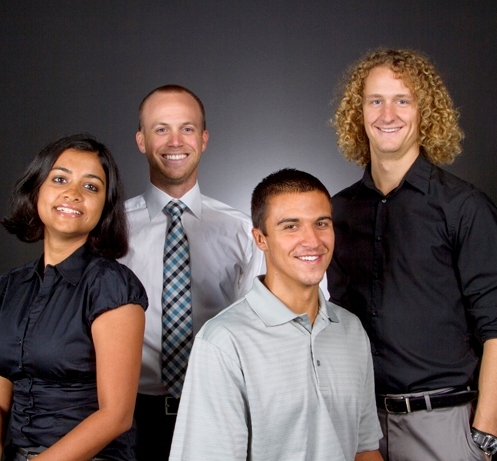 Above: Among the founding members and officers of the Fulton Student Veterans Organization are military veterans (left to right) Jordan Isaac, Raymond Potts, Patrick Gaines, Richard Duarte and David Ramirez. Photo courtesy of Fulton Student Veterans Organization. “Being in the military gives you a sense of purpose, but when you get out you can feel aimless, and it can be difficult to get that sense of purpose back,” says Rick Duarte, a Marine Corps veteran majoring in computer systems engineering in the Ira A. Fulton Schools of Engineering at Arizona State University. “It’s a challenge for vets to assimilate back into a normal environment after being in hostile environments. You have to learn to be social again,” says Jordan Isaac, an ASU mechanical engineering major and Marine Corps veteran. Along with working to earn their own degrees, Isaac and Duarte are putting effort into helping other engineering student military veterans navigate their way through college and into civilian careers. They are among founding members of the new Fulton Student Veterans Organization established earlier this year. About 1,700 of the Fulton Schools’ 20,000-plus undergraduate and graduate students are military veterans. The small group of those vets who are getting the FSVO off the ground say that partnering with the Fulton Schools, where students have similar interests and goals, can offer these student veterans closer attention than they might get from larger, university-wide veterans organizations. FSVO’s leaders have been planning and organizing activities through collaborations with the Fulton Schools’ staff in student recruitment and retention, student engagement and transfer student services. They’ve recruited Fulton Schools faculty members who are also military veterans to serve as advisors to the organization. 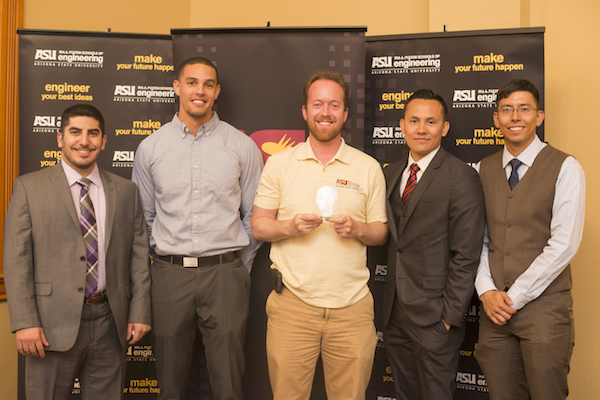 “I’m honored to serve as one the their advisors and I applaud their commitment to helping engineering students succeed at ASU,” says Professor G. Edward Gibson Jr., director of the School of Sustainable Engineering and the Built Environment in the Fulton Schools. Gibson served as an officer in the U.S. Army Corps of Engineers. The group is starting to get support from some of the many other Fulton Schools student organizations as well. “Other engineering students and groups want to support the student veterans in their schools,” says FSVO founder and first president Patrick Gaines, a Marine Corps veteran working on a master’s degree in computer science. Marine Corps vet David Ramirez, an electrical engineering major, is the incoming president. Duarte is the vice president and Isaac is the social engagement officer. Army vet Jonathan Lyle, a construction management major, is the treasurer and Raymond Potts, a civil engineering major, is the academic success chair. Ramirez says the group is looking to fill additional officer positions and has other opportunities for students who want to help support engineering student veterans. Gaines says the organization’s goal is to offer “a buffet of opportunities” to student vets, starting with connecting them to mentors, tutors and others to help guide them through their schooling. 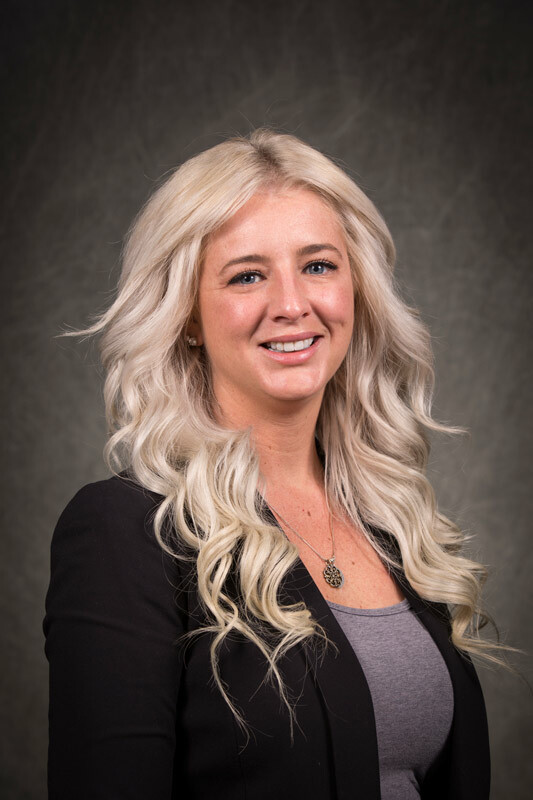 With a leadership team of only six student vets, FSVO has already held gatherings to talk to student vets about professional development, preparing for job interviews and writing effective résumés, and have connected vets with industry recruiters. In addition to expanding all of those services, FSVO’s leaders are talking about doing outreach to vets studying engineering at community colleges who are likely to transfer to ASU to earn undergraduate degrees, and they want to connect with engineering student veterans in online programs — who make up the majority of student veterans in the Fulton Schools. 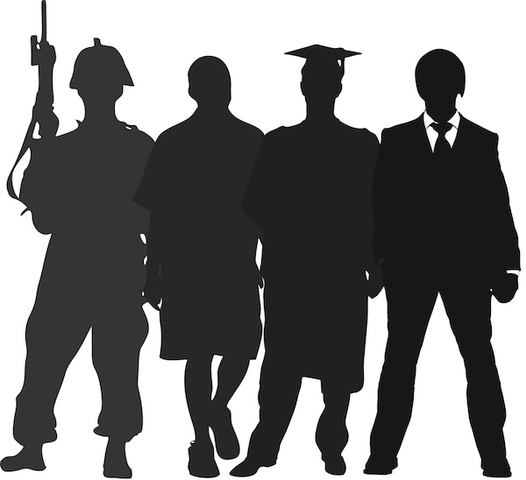 The illustration created by the Fulton Student Veterans Organization depicts a soldier’s transition to civilian, college graduate and career professional. Ramirez says FSVO hopes to extend its membership and services to students who have military-affiliated family, members of the Reserve Officer Training Corps and students interested in engineering careers related to national security. To create camaraderie between so many student veterans, the new organization will need to be to establish rapport among a diverse group of people — spanning across differences in background, ethnicity, race, gender and culture. “There are people from all branches of the military and people who had all kinds of various military roles, and some really different personalities,” Duarte says. But he adds that veterans of all stripes have experiences in common that provide FSVO leaders a platform for opening lines of communication among a disparate group. 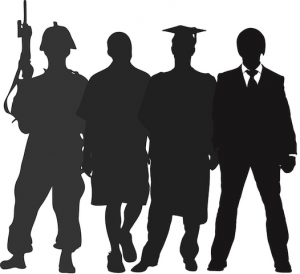 Another difference is that many veterans are several years older than the majority of college students. They have families and mortgages and other responsibilities younger students don’t have. That’s a reason FSVO leaders want to get the vets involved with other students. In particular, they’d like to see vets join student organizations, especially those focused on collegiate engineering competitions. Having people with strong goal-oriented, military mindsets would be a significant asset to a student team. Such experiences could help vets feel they fit in with fellow students, FSVO leaders say.